To make Pani - Combine all the ingredients, add 1/2 glass of water and blend it in a blender. Add 3 glass of water and mix it well. Put it in the refrigerator for 1-2 hours before serving. Or you can use cold water while making pani. You can change the measurement according to your taste. To make stuffing - Peel the boiled potatoes and mash it with hands. Add sprouted moong, pomegranate seeds, apples, salt, black salt, red chilly powder, chaat masala and mix it well. To serve - Make a small hole in all the puris. 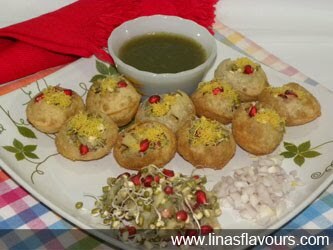 Fill up with potato-moong stuffing, add onions, boondi, sev, tamarind chutney and mint pani. Serve it immediately. You can serve pani in a bowl also so that each one can enjoy in his/her way. You can even mix tamarind chutney and mint pani.